Sympistis mirificalis is a small (FW length 13 - 14 mm) fall-flying noctuid moth with a gray-brown forewing with pale filled forewing spots, long black wedges on the distal wing, and bright yellow hindwing with a black marginal band that flies in eastern Oregon, eastern Washington and southern Idaho during the fall. The ground color is brown-gray, lighter in the medial subterminal area and darker gray near the outer margin. A thin black basal dash ends at the base of the claviform spot. The antemedial and median lines are absent except for oblique black lines across the costa. The postmedial line is similar on the costa but is also represented by an oblique gray line below the reniform spot. The subterminal line is pale gray, thin, and very irregular. It is preceded by long black wedges between the veins. The terminal line is thin and black. The fringe has a striped light gray and gray base and strongly checkered light gray and gray edge. The three forewing spots have thin outer black and inner white outlines and are filled with the ground color. The orbicular spot is long and oval, with the reniform spot is narrow and boomerange-shaped. The clavifom spot is very long. The hindwing is pure bright yellow with a jet black marginal band and no suffusion. The fringe is tricolored, yellow, gray, with a white edge. The head and thorax are gray-brown with a dark edge on the collar. The male antenna is filiform. 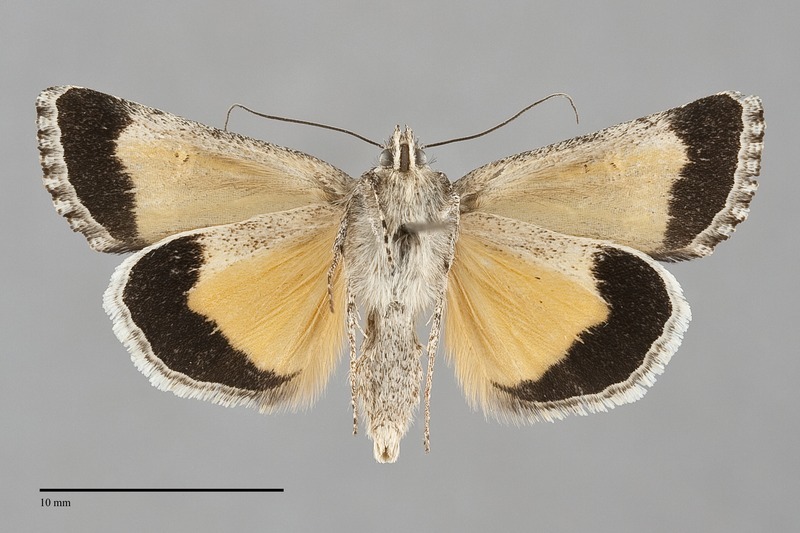 This species can be identified from other Sympistis species with yellow and black hindwings by its gray-brown forewing, the dark outlines of the forewing spots, and the long black streaks near the outer margin. 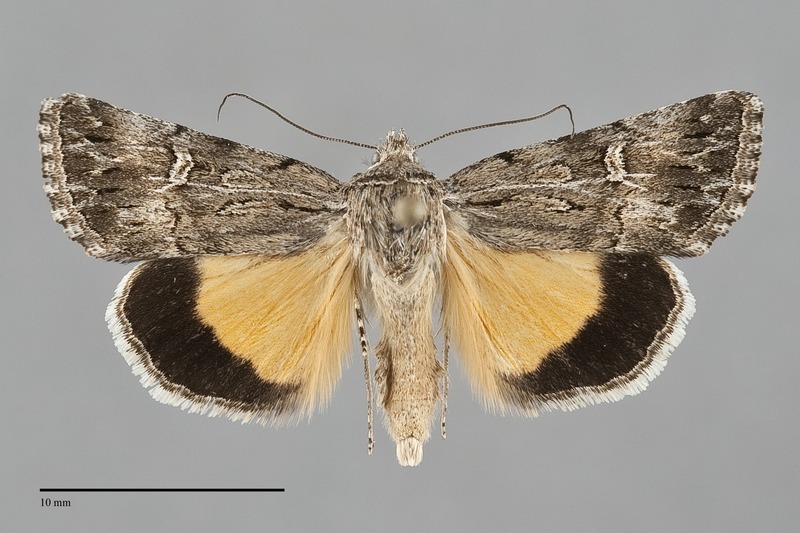 Pseudanarta flava and Pseudanarta singula have brown forewings and similar yellow and black hindwings. Neither of these species has a long oval orbicular spot or irregular subterminal line preceded by long black wedges. 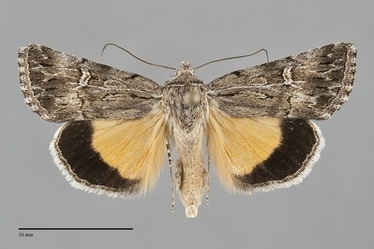 The ventral surface of both wings are yellow with black margins in S. mirificalis, while the dark markings on the ventral forewings of Pseudanarta species are dark gray. This species appears to be rare and sporadic east of the Cascades, and is found on dry, open sagebrush steppe, in juniper woodlands, and in dry canyonlands at low to middle elevations. This species is associated with lithosol and rock outcrops. Sympistis mirificalis has been found in the central portion of the Columbia Basin in Washington, and at middle to low elevations along the east slope of the Cascades east through central Oregon to near the Blue Mountains in the Northwest. It has only been collected once in Idaho near rocky outcrops in the Black Pine Mountains near the border with Utah. The range of this species includes Colorado and eastern and southern California outside of our region. No information is presently available regarding larval foodplants of this species. It probably feeds on a species of Penstemon (Penstemon spp.) in the Scrophulariaceae, the most common foodplant for related species. Sympistis mirificalis flies during September in the Northwest. It is nocturnal and comes to lights.